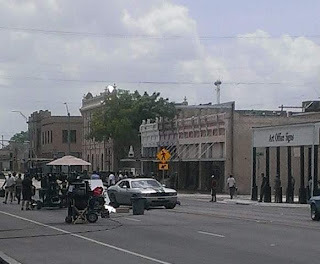 Transformers Live Action Movie Blog (TFLAMB): New Transformers 4 Car Spotted in Taylor, TX? New Transformers 4 Car Spotted in Taylor, TX? KXAN has posted a report from Taylor, Texas as Transformers 4 films in the city. While it covers the same ground as yesterday's videos, their written report mentions "A silver Dodge Challenger can be seen in the middle of West Second Street." The image from TFW2005 does suggest it might have some significance since doesn't quite fit the hometown vibe the other older cars seen on the set have but it could just also be a car driven by one of the characters.